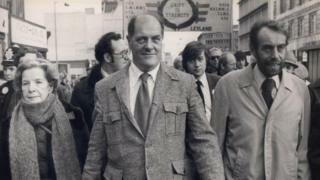 The former British Leyland worker and trade unionist Derek Robinson has died, aged 90. Mr Robinson, one of the most famous trade unionists of the 1970s, was dubbed Red Robbo by the media. As shop steward at British Leyland in Longbridge, Birmingham, he was involved in a series of strikes and walkouts over alleged mismanagement. The Unite union said the "dedicated life-long trade unionist" fought for "the rights and future" of workers. Mr Robinson was involved in an estimated 500 disputes at Longbridge. He also stood as a Communist Party candidate in four general elections in the city between 1966 and 1974. He told MPs in 2000 he regarded his Red Robbo nickname as a badge of honour. "I can sleep sound at night because I never betrayed the workers I was elected to represent," he said. Unite general secretary Len McCluskey said: "History will show that Derek was unfairly maligned by the media as he aimed to find solutions to British Leyland's industrial disputes and turn around the car company. "He is quoted as saying: 'If we make Leyland successful, it will be a political victory. It will prove that ordinary working people have got the intelligence and determination to run industry'. "These words are a suitable epithet for a stalwart of the trade union movement, whose passing we mourn." Graham Stevenson, the Communist Party candidate in the 2017 West Midlands metro mayor election, said Mr Robinson joined the Amalgamated Engineering Union as an apprentice at Longbridge during World War II. "The Communist Party then dominated the factory's workforce, with many hundred Daily Workers [newspaper] being sold every day," he wrote in his blog. Mr Robinson was elected shop steward soon after the end of his apprenticeship and by the late 1940s was a member of the Communist Party "in which he remained for the rest of his life", Mr Stevenson said. He was the main spokesman for the British Leyland combine committee which united about 40 different plants around the country, for most of the 1970s. Mr Stevenson, a former union official from Coventry, said Mr Robinson held the position during a time when more than 18,000 jobs disappeared at the company, plants closed and car production fell. He added that communists active in Unite "mourned the loss of their most distinguished veteran, a mentor and guide to us all". In the 1980s and 90s, Mr Robinson worked as a tutor in trade union studies, teaching shop stewards.